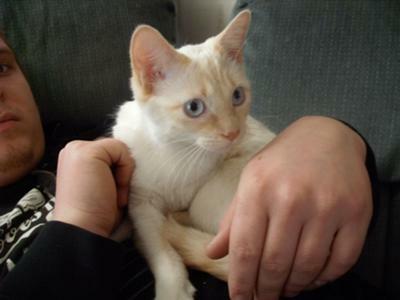 I just adopted a Flame point Siamese from the Humane Society. I saw her and couldn't leave without her! I used to have a Seal point who's name was Darling - aka Ling Ling. She was full of charisma. This little Flame point Sookie is just the biggest love! Thank you Amber for your pictures of Sookie and Ling Ling - beautiful cats, both of them. Ling Ling looked like a lovely example of an old-style or Classic Siamese (or perhaps an Applehead? ), and she was a beautiful dark Seal Point. Oh my goodness she looks just like my flame point Jax! My flame point is Fred, your baby is so cute! All I could say is OMG - darling! Mine's a lover too. They are very smart, like a human. Mine stays on my shoulder and jumps on my back. I can't get over how cute yours is. My Fred looks just like yours. It was like looking at a pic of my lil guy! 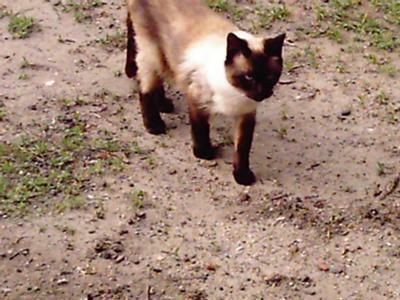 Ling was definitely an Applehead Siamese, and she was actually darker than that before she passed away. I hadn't ever seen one with markings that dark. And I had never even heard of a flame point Siamese before I saw Sookie! She's a spunky little thing- she likes to attack us when we're sleeping - LOL!